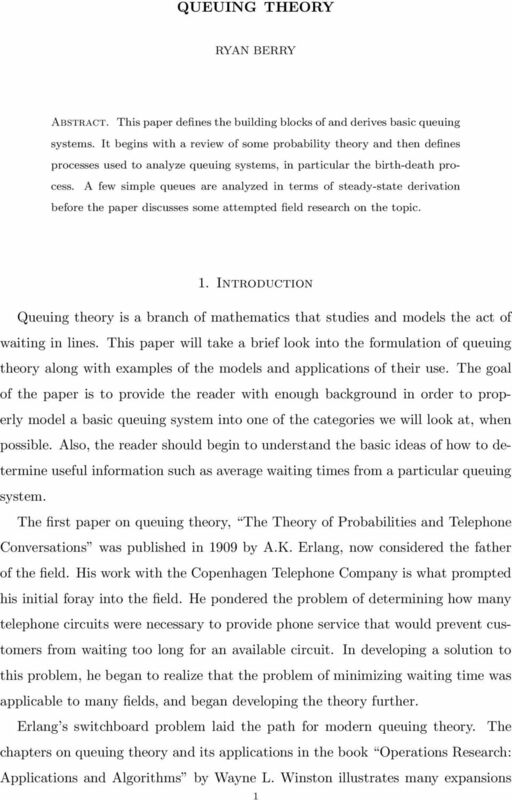 Download "QUEUING THEORY. 1. 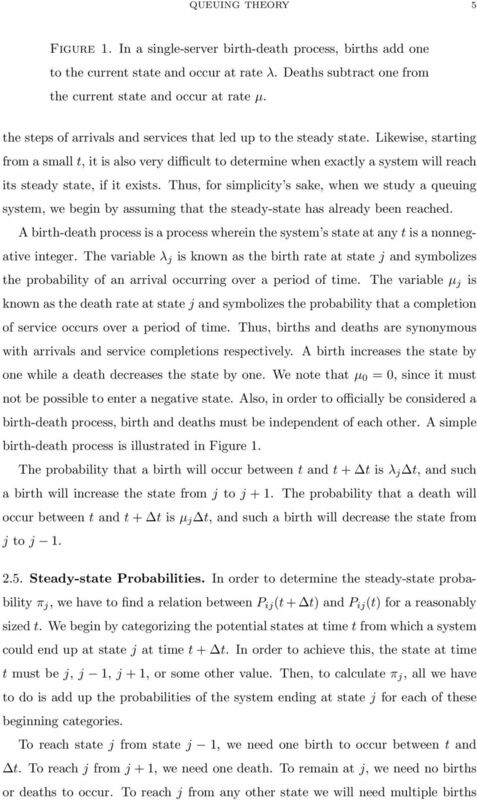 Introduction"
12 12 RYAN BERRY that the steady state probability at state j is π j = ( λ µ )j e ( λ µ ) 3.5. The Machine Repair model. The machine repair model is a M/M/R/GD/K/K queue system, where R is the number of servers, and K is both the size of the customer population and the maximum number of customers allowed in the system. This model can explain a situation where there are K machines that each break down at rate λ and R repair workers who can each fix a machine at rate µ. 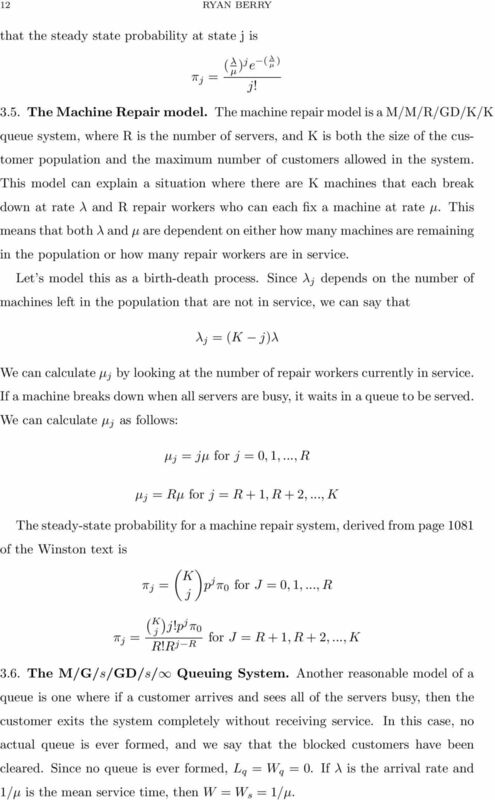 This means that both λ and µ are dependent on either how many machines are remaining in the population or how many repair workers are in service. 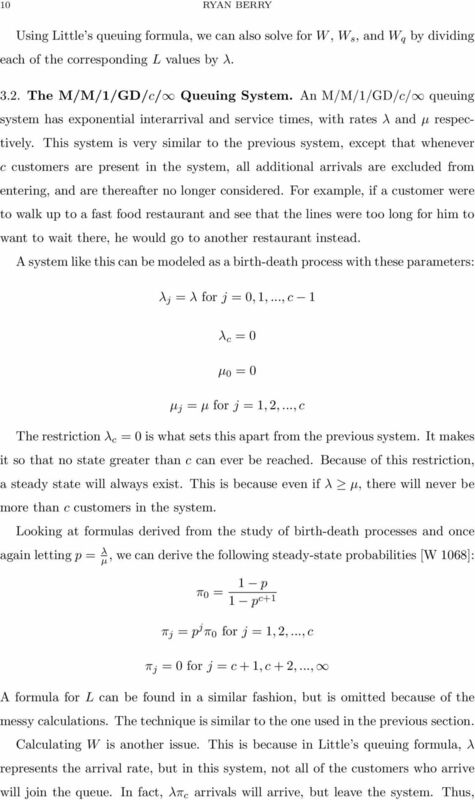 Let s model this as a birth-death process. Since λ j depends on the number of machines left in the population that are not in service, we can say that j! λ j = (K j)λ We can calculate µ j by looking at the number of repair workers currently in service. If a machine breaks down when all servers are busy, it waits in a queue to be served. 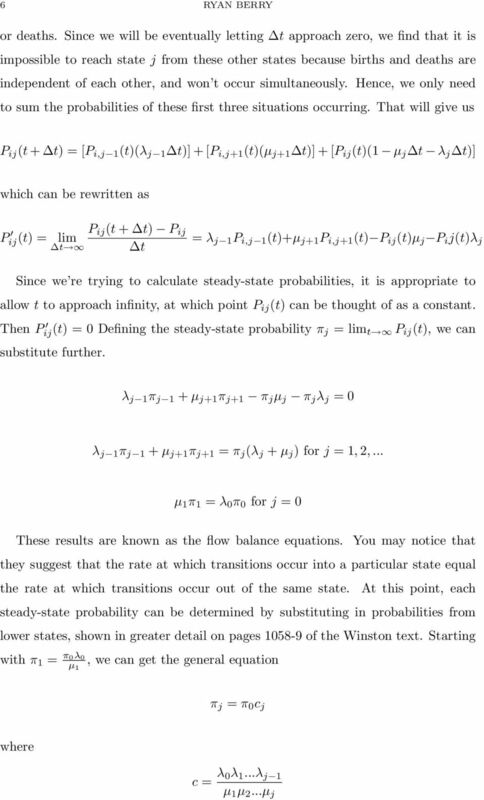 We can calculate µ j as follows: µ j = jµ for j = 0, 1,..., R µ j = Rµ for j = R + 1, R + 2,..., K The steady-state probability for a machine repair system, derived from page 1081 of the Winston text is π j = ( ) K p j π 0 for J = 0, 1,..., R j π j = ( K j R!R j R ) j!p j π 0 for J = R + 1, R + 2,..., K 3.6. The M/G/s/GD/s/ Queuing System. 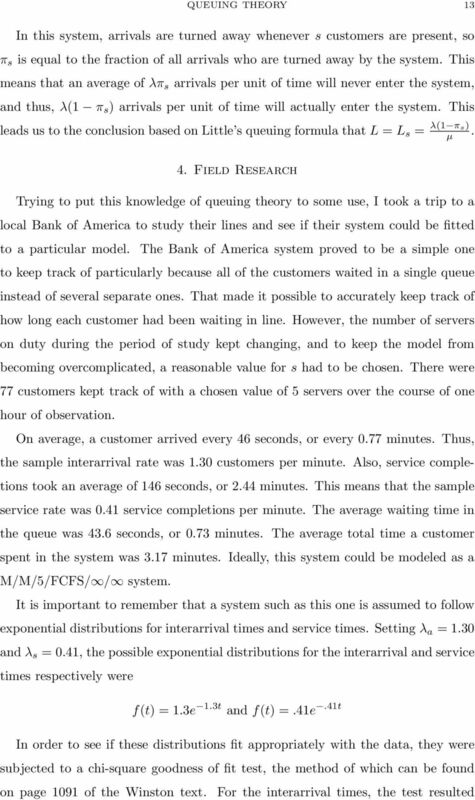 Another reasonable model of a queue is one where if a customer arrives and sees all of the servers busy, then the customer exits the system completely without receiving service. In this case, no actual queue is ever formed, and we say that the blocked customers have been cleared. 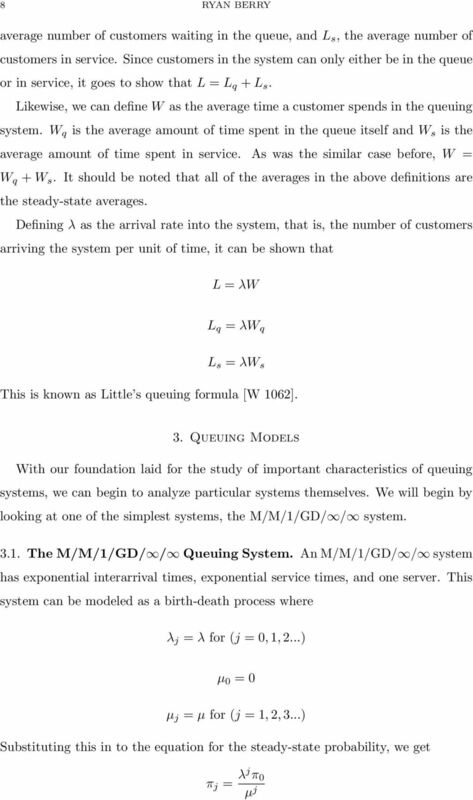 Since no queue is ever formed, L q = W q = 0. If λ is the arrival rate and 1/µ is the mean service time, then W = W s = 1/µ. 14 14 RYAN BERRY with χ 2 (obs) = 2.026, which was low enough to conclude that the exponential distribution can properly model the interarrival times. However, for the service times, the test resulted in χ 2 (obs) = 36.57, which was well out of the range for the service times to be properly modeled by the exponential distribution. It seems that this could be a consequence of using a relatively small sample size. Chi-square tests were performed with other distributions as well, but nothing seemed to fit reasonably. Thus, we were unable to fully connect this study with one of the previously studied models. 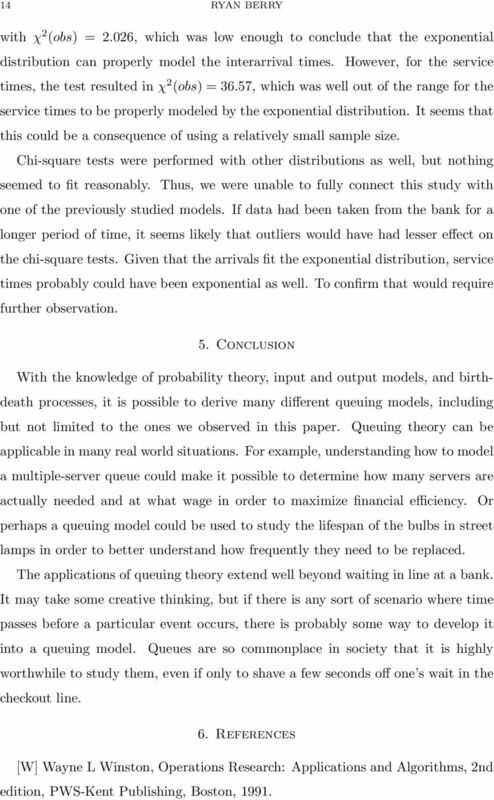 If data had been taken from the bank for a longer period of time, it seems likely that outliers would have had lesser effect on the chi-square tests. 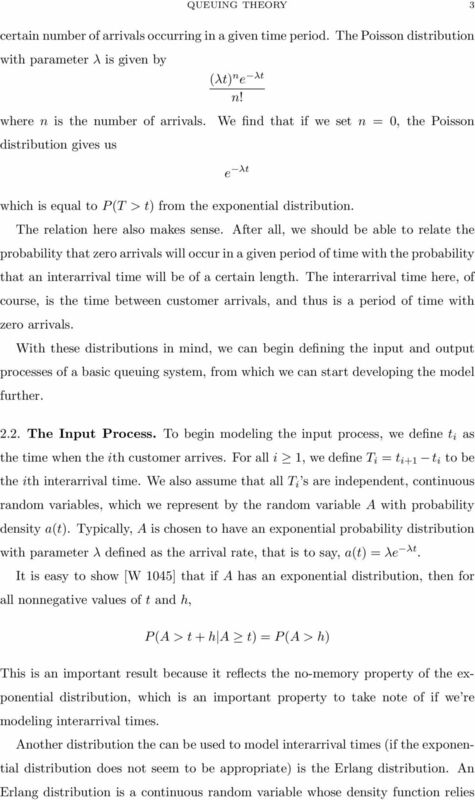 Given that the arrivals fit the exponential distribution, service times probably could have been exponential as well. To confirm that would require further observation. 5. 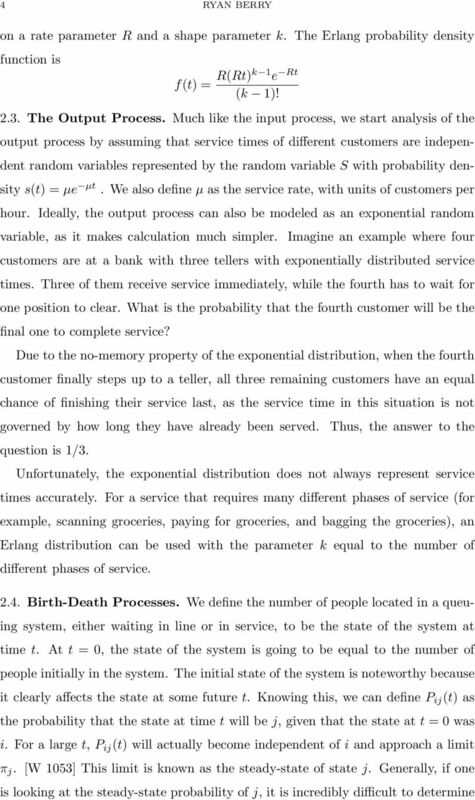 Conclusion With the knowledge of probability theory, input and output models, and birthdeath processes, it is possible to derive many different queuing models, including but not limited to the ones we observed in this paper. Queuing theory can be applicable in many real world situations. 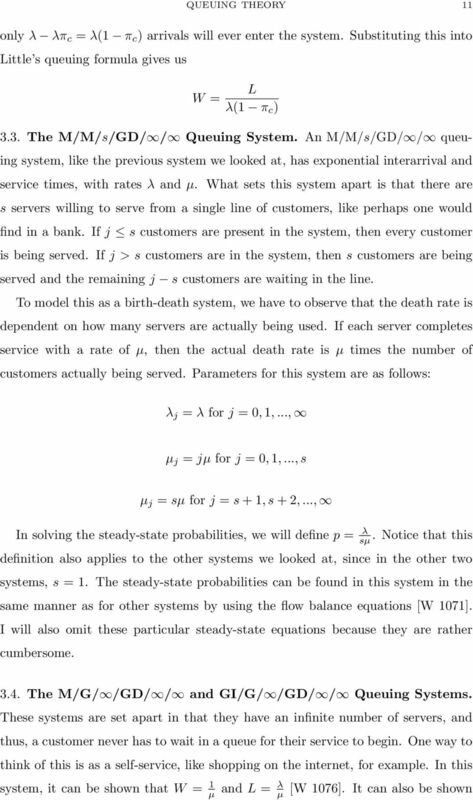 For example, understanding how to model a multiple-server queue could make it possible to determine how many servers are actually needed and at what wage in order to maximize financial efficiency. Or perhaps a queuing model could be used to study the lifespan of the bulbs in street lamps in order to better understand how frequently they need to be replaced. The applications of queuing theory extend well beyond waiting in line at a bank. 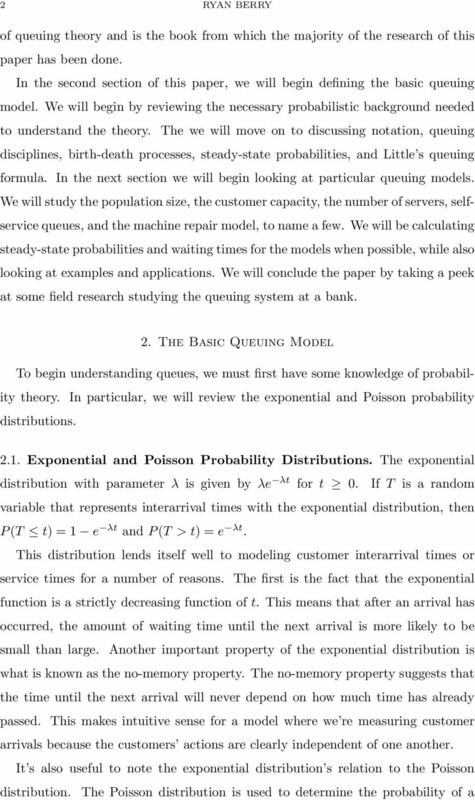 It may take some creative thinking, but if there is any sort of scenario where time passes before a particular event occurs, there is probably some way to develop it into a queuing model. Queues are so commonplace in society that it is highly worthwhile to study them, even if only to shave a few seconds off one s wait in the checkout line. 6. 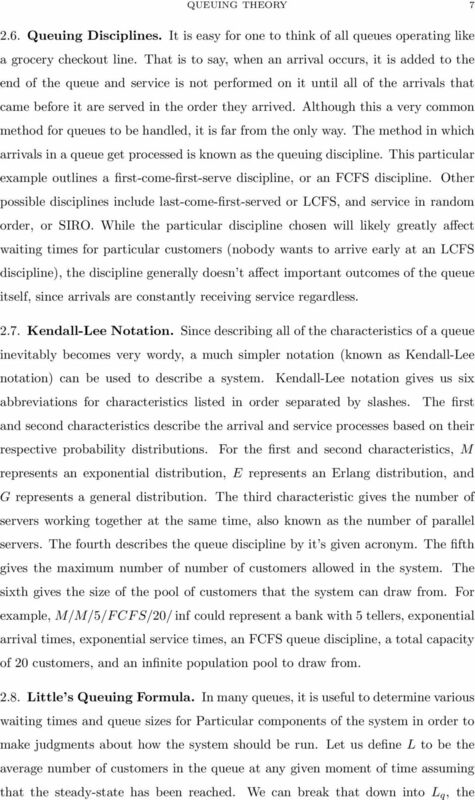 References [W] Wayne L Winston, Operations Research: Applications and Algorithms, 2nd edition, PWS-Kent Publishing, Boston, 1991. A fairly quick tempo of solutions discussions can be kept during the arithmetic problems. Section 1.3 P 1 = 1 2. = 1 4 2 8. P n = 1 P 3 = Continuing in this fashion, it should seem reasonable that, for any n = 1, 2, 3,..., = 1 2 4. Unit 1 Number Sense. In this unit, students will study repeating decimals, percents, fractions, decimals, and proportions. 8 Primes and Modular Arithmetic 8.1 Primes and Factors Over two millennia ago already, people all over the world were considering the properties of numbers. One of the simplest concepts is prime numbers. 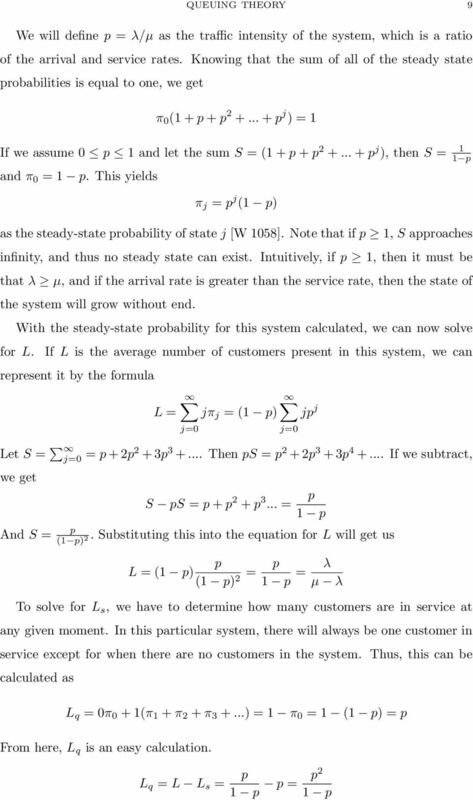 Second Order Linear Nonhomogeneous Differential Equations; Method of Undetermined Coefficients. y + p(t) y + q(t) y = g(t), g(t) 0. Solving LPs: The Simplex Algorithm of George Dantzig. Simplex Pivoting: Dictionary Format We illustrate a general solution procedure, called the simplex algorithm, by implementing it on a very simple example.